DANIEL GRAFF. The subject of this sketch, a fine old German-American farmer located in Central Township, came to Bond County, Ill., in 1841 with no means, but now possesses one hundred and eight acres of fine land and is the only one of the original settlers left in Central Township. A sketch of his life will prove interesting. Daniel Graff was born in a province of Rhenish Bavaria July 22, 1821, and is the son of Peter Graff, a native of the same place. Grandfather Caspar Graff was also a Bavarian, where he followed an agricultural life and served under Napoleon in the Russian campaign. His death occurred in Germany when he was about eighty-eight years of age. The father of our subject also became a farmer, but with only moderate success. He came to America in 1853, after which he made his home with our subject and died at the age of eighty-two years, a member of the Reformed Protestant Church. The mother of our subject was Mary Shire, a native of the same province as her husband, and she became the mother of five children, namely: Michael, Daniel, Henry, Barbara and Peter. Her life ended when she was only thirty-seven years old. She had been a member of the Reformed Protestant Church and her remains now lie buried in Germany. The father of our subject contracted a second marriage, when Catherine Colter became his wife, and two children were born of this marriage, Frederica and Fred. Our subject was reared on the farm in Germany and attended excellent schools there until he was eighteen years of age. He then started for America and after a tiresome voyage of sixty-one days on the Atlantic Ocean, and ten days more before he landed at New Orleans, he was ready for his last stage of the journey and came up the Mississippi River to St. Louis. Leaving the city he went into St. Clair County, but returned to St Louis, remaining until the spring of 1841, when .he entered forty acres of his present farm from the Government, and very soon bought more land, it being all wild at that time. The few log houses of the settlers were far apart, deer ran in droves across his farm, and wolves and turkeys were daily seen. The first act of our subject was to erect a log cabin in the woods, and here he lived until 1849, when, having cleared up the most of his farm, he felt it to be a fit place to which to bring his bride. However, June 3, 1846, he had enlisted in Company C, Third Illinois Regiment, and went to the Mexican War, where he served twelve months under Gen. Scott. He took part in the bombardment of Vera Cruz and the battle of Cerro Gordo, and was in many skirmishes. After he came home he was married, September 25, 1849, to Miss Nancy McAdams, who was born December 5, 1831, in this township. Twelve children have been born to our subject and his wife, seven of whom are now living, namely: Sylvanus C., Lois C., Clara, Mary, Henry, Don and Vausie. 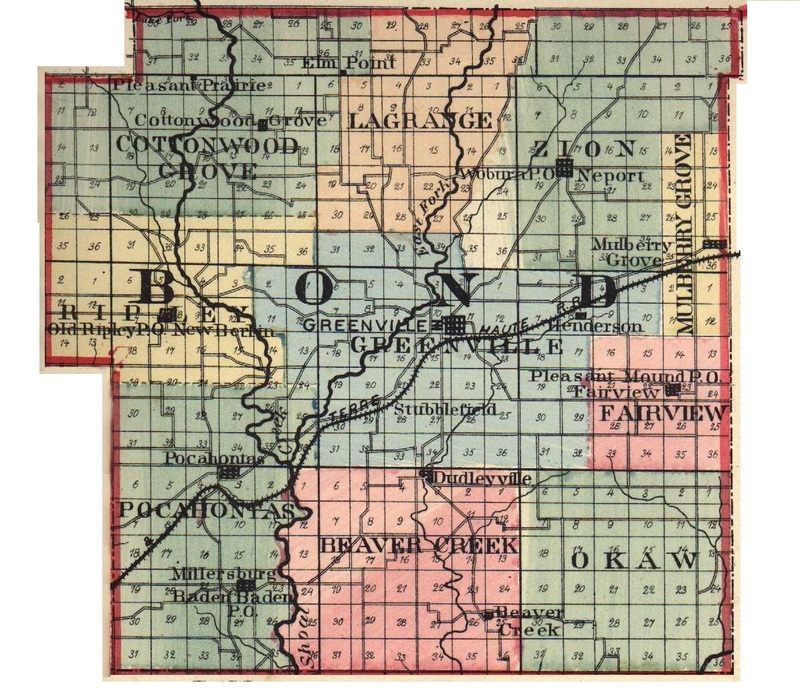 Sylvanus C. married Lucy Durant and they live in this township; Lois C. married Clara Hockett and they live in Mills Township; Clara married A. T. Porter and they live in Vandalia, Ill.; Mary married Edward Briggs and they live in Montgomery County; Henry married Leulla Bird and they live in Mills Township, this county. Mr. Graff now owns one hundred and eighty acres of improved land, and he has cleared almost all of it himself and has carried on both grain and stock-raising on it. His present comfortable residence was erected in 1869 where he and his family reside. Our subject is a stanch supporter of the principles of Democracy. His wife is a devout member of the Cumberland Presbyterian Church. Mr. Graff has served his district as School Director acceptably for nine years and has taken great interest in educational matters. He has not only seen the growth of his own fortunes, but has viewed with satisfaction the march of improvement in the district and county. Always ready for any move which seemed to promise well for his neighborhood, Mr. Graff has made a favorable impression on all with whom he comes in contact. Extracted 20 Dec 2016 by Norma Hass from 1892 Portrait and Biographical Record of Montgomery and Bond Counties, Illinois, pages 412-413.